CCM cello faculty member Alan Rafferty is rapidly gaining recognition as a preeminent musician and master teacher. In demand as a clinician around the world, Rafferty has presented Master Classes at numerous schools including the Cleveland Institute of Music, Northwestern University and Depaul University. In addition, he has been a visiting faculty member for the Cleveland Institute of Music, Malta Philharmonic Orchestra and the New World Symphony. A member of the Cincinnati Symphony Orchestra since 2007, Rafferty made his solo debut with orchestra at the age of 16 and has been a featured soloist on numerous occasions since. In November 2013, he gave the North American premiere of Victor Herbert's first published work, the Suite for Cello and Orchestra, Op. 3 and will perform Don Quixote with the CCM Orchestra and Mark Gibson this coming season. He can be heard on recordings for Telarc, Sono Luminus, CR and for WGUC Radio Station. Rafferty regularly collaborates as a chamber musician with the likes of Matt Haimovitz, the Ariel Quartet, Sandra Rivers and members of the Cavani Quartet. In the summers, Rafferty is on the faculty of the Green Mountain Chamber Music Festival in Burlington, VT, and the Aria International Summer Academy. Previous summer festivals have included Meadowmount, Madeline Island and the Great Wall International Music Academy in Beijing. 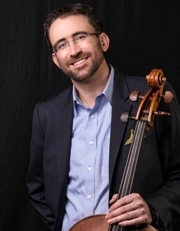 His students have been 1st prize winners in the MTNA National Solo Competition, Louisville Orchestra Competition, Cleveland Cello Society, Tennessee Cello Workshop and have played as soloist with the Cincinnati Symphony, Louisville Orchestra and Dayton Philharmonic. As cello/chamber music faculty for the Starling Program at CCM his groups have won the Junior Division Gold Medal of the Fischoff Chamber Music Competition among others. He and his wife, cellist Sarah Kim, were recently named the 2016 Ohio String Teachers Association Studio Teachers of the Year. They are the founders and directors of the nationally recognized Cincinnati Young Artists, which presents Chamber Music and Cello Workshops throughout the year. Learn more at cincinnatiyoungartists.org. B.Mus, Cleveland Institute of Music, Clevaland, OH. MM, Northwestern University, Evanston, IL.